Dr. Mrs. Meena Muthiah, the Kumara Rani of Chettinad is a woman of diverse talents and interests. Hailing from a family of philanthropists and educationists, she has committed herself to the noble cause of shaping young minds of our nation, by starting this temple of knowledge, Chettinad Vidyashram – a school that aims at holistic development of its wards. Dr. Mrs. Meena Muthiah is not only the Correspondent and Senior Principal of the institution; she is a role model to the staff and the students. She manifests dedication to her mission, excellence in her accomplishments and humility in her attitude. 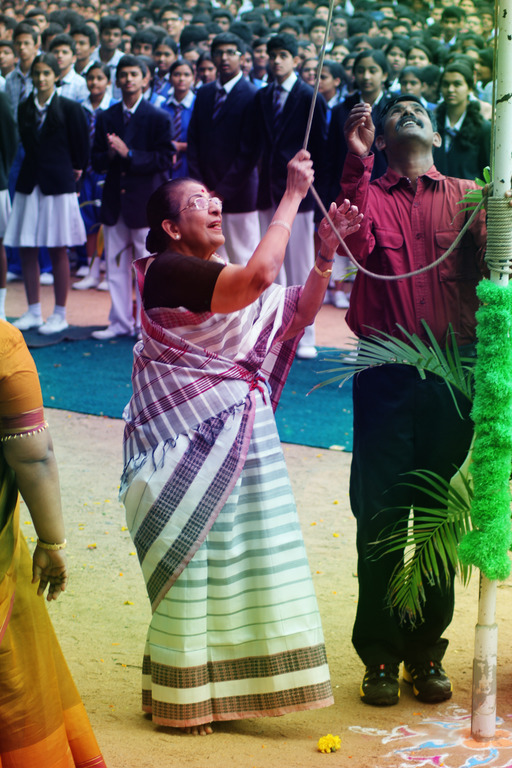 Her untiring effort and able guidance has ranked Chettinad Vidyashram 13th in the South Zone League of Day Schools and third in the city by Education World, an annual publication. She has the unique distinction of being the first woman from Chettinad to enter the convocation hall to get not one but five degrees.She is a bundle of energy and would easily outshine young generation by her poise, enthusiasm, willpower and natural charm. with singular devotion revived the Tanjore Art. Her students’ paintings have been chosen for State and National awards. She has won many awards for her service in various fields. Kumara Rani Meena Muthiah Higher Secondary School. Kumara Rajah Muthiah Higher Secondary School. Kumara Rani Meena Muthiah Matriculation School. Kumara Rajah Muthiah College of Music. Kumara Rani Meena Muthiah College of Arts and Science. Honourable Citizen of the Year Award in August 2012 by Hamsadhwani. Conferred the Degree of “Doctor of Letters” (Honoris Causa) by Periyar Maniammai University Dr. Mrs Meena Muthiah was the recipient of the Living Craft Treasure Award for 2016-2017. This award was presented to her by Poombukar Government of Tamil Nadu for promoting the Tanjore Art Painting. She received a gold medal, a citation and a cheque for ₹ 1,00,000/-. Life Time Achievement Award by Womanation in 2017. Women’s Voluntary Science of Tamil Nadu along with various other esteemed Madras Associations honored Dr. Mrs. Meena Muthiah with the Distinguished Woman of Madras at the Madras Week Celebrations on 28th August, 2018 at the Madras School of Social Work. Her keenness for service has no boundaries. She heads several voluntary organizations and renders with zeal her services to the society. Participates in and involves children in community services under Season of Sharing focusing on under privileged children. Has promoted computer literacy in rural districts by a tie up with Annamalai Polytechnique. For the benefit of rural folks she has improved medical facilities by setting Kumara Rani Meena Muthiah Mother and Child Hospital, Kanadukathan.